During the 1930s the Jewish photographer, Roman Vishniac based in Berlin, toured Eastern Europe taking photographs. 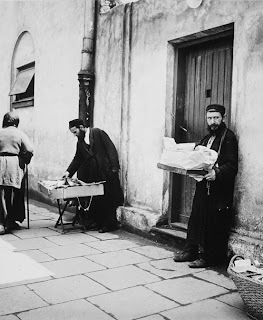 He photographed Jews based in the villages and towns of Eastern Europe. Many of these photos according to the Paris Journal are being exhibited in Paris at the Musée d'art et d'histoire du judaïsme. Vishniac escaped Europe in 1940 and headed for America taking his photographs of Eastern European Jews with him. Vishniac had to proceed secretly often under pressure from the authorities and having to hide his camera from his subjects- many of those photographed were Orthodox Jews for whom their own image was a sacrilegious object. Vishniac succeeded though and roughly 2,000 of his photographs of Jews survive- a precious memory of a cosmopolitian world that now has vanished. For those not in Paris who wish to survey some of the pictures- there are 31 on this website (you have to open a pop up window within the site), two more images are here, there are a couple more at the bottom of this page, six or so here and some more photographs are used in the Wikipedia article on Vishniac here. Here is another one that I couldn't resist posting on this website. Vishniac seems to me to capture in the two photos I've put on this blog something very individual about his subjects. 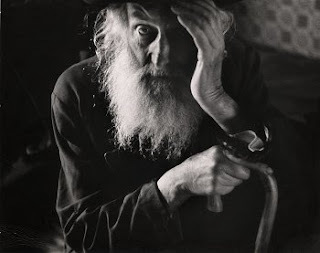 We know of course what was about to happen in Eastern Europe and we also know the grinding poverty in which many of these individuals lived- but Vishniac seems to show them with a certain dignity, his photos show them as individuals. When we think about an event like the Holocaust or any other atrocity, its very easy for the people to become numbers- rather than people. Vishniac's photos to me, like other photos of Jews who died in the Holocaust or other victims of genocide, bring back to me the sense that rather than a number dieing it was a number of human beings. It was not 6 million who were killed but 6 million individual people. As a historian I constantly deal with vast numbers of people who are killed and it is very easy to abstract away to the number. What photos like these bring to me is the sense that it is individuals and not numbers that are involved. Its a tragedy whenever someone is murdered- what happened in Eastern Europe was 6 million tragedies all at the same time. 6 million people were cut off from being fathers, mothers, brothers, sisters, husbands, wives, sons, daughters and generally from being people. Because these photos show us the Jews as people with plans for the future, aspirations, hopes, dreams and families, it makes the waste of what did actually happen to these people all the more bitter and all the more sad. Thank you for sharing this. I've just discovered your blog and have enjoyed what I've seen so far. Cheers mate- I'll have a look at yours too but am a bit tired at the moment. I'm glad you like it though.